So Friday I stayed home from work again because I'd pretty much lost my voice and I was still pretty tired. I cleaned our apartment a bit, but mostly studied for a test. An hour or so before Scott got home, I made rice and beef stir fry--one of our favs. And it was warm and waiting for Scott when he returned home. Scott surprised me with the most beautiful flowers (it's harder to do these days because we are always together. Then, as I was getting the table set and dinner finalized, we were talking about what we might like to do tonight. He said how about a movie? 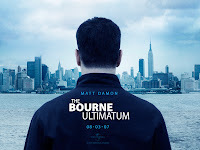 I said Ok, He said How about The Bourne Ultimatum (at the dollar theatre). I said yeah, we should see what the times are. He said, I already did. In fact ... [pulls out tickets]. Me: [surprised] oh great!! You've already got tickets and everything! It indeed was a nice surprise because I really do hate waiting in the cold to get tickets for stuff. So we ate our yummy dinner and then headed out to the dollar theatre and watched The Bourne Ultimatum. It was great, as all the Bourne movies were. I really really enjoyed it and so did Scott. The night was full of fun and surprises and it was just so nice to get out and have a nice simple date with my adorably loving husband. I really am in love with him.